RapidFix is a scientifically developed dual-component adhesive system comprised of a powerful, instant bonding adhesive and welding powder. 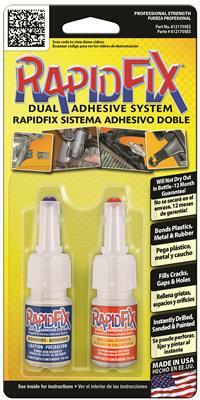 The adhesive can be used alone or can be combined with the Welding Powder to instantly fill cracks, holes and gaps. The powder is formulated to harden instantly as it comes into contact with the adhesive. The repair can be drilled, filed, sanded or ground to any shape. The dried combination of RapidFix Adhesive and Welding Powder can be painted or stained to match the surface around it. The RapidFix adhesive dries crystal clear and bonds most material instantly. These materials include rubber, metal, plastics, copper, aluminum, steel and most plastics. RapidFix Welding Powder is used in conjunction with the adhesive to repair all types of holes, cracks and gaps by creating a strong weld seam that is as supportive as solder or a welded joint. RapidFix can also be used to build up or replace missing areas of the part that is broken. Rapidfix can be instantly drilled, filed, sanded. Because it dries clear or a neutral color it can be easily painted or stained to any color. RapidFix is the only product that can repair windshield wiper bottles over flow tanks and air intake systems. It can also repair, gas tanks, radiators, headlight housings and can be used for electrical wiring. 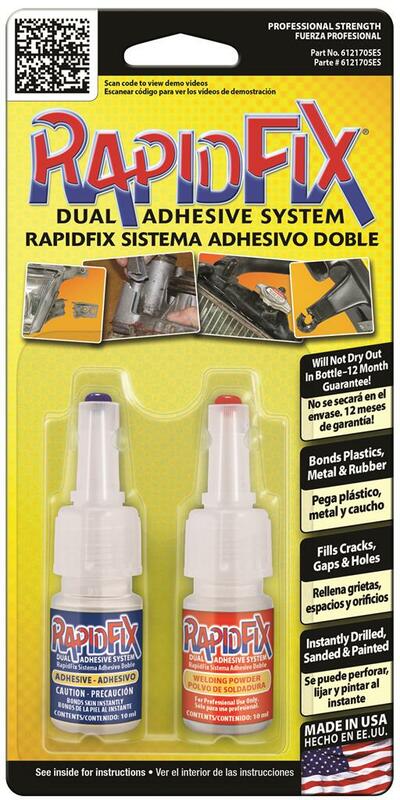 Unlike all other instant adhesives RapidFix has a special formula that will not dry out in the bottle. RapidFix Adhesive and Welding Powder produces high strength bonds in seconds and is an ideal solution for emergency automotive repairs. The Dual Adhesive System quickly and permanently repairs bumpers, radiators, headlights, air intakes and water pumps. The Adhesive dries instantly and can be used on its own to bond any non-porous material to itself or other like material. When the adhesive is combined with the welding powder it can instantly fill cracks, holes and gaps. The welding powder can also be used to support repairs. The repair can also be drilled, filed, sanded or ground to any shape that suits the repair. Because it is a neutral color it can be easily painted or take wood stain.